In the Northern Hemisphere tomorrow is the Spring or Vernal Equinox or 'Ostara', depending on which traditions you follow. (If you're in the Southern Hemisphere, please click here for my Mabon / Autumn Equinox spread!) Whatever name you choose to use, this is the time when the daylight and darkness are of equal length and the promise of Spring is in the air. Daffodils, winter aconites, primroses, and even a few butterflies and sleepy bees can all be spotted now - between blustery showers and the odd snow storm! In ancient times, this was considered the new season for farming and battle, as the days are lengthening and the weather should, in theory at least, be improving. Since last Summer Solstice I've been writing a new spread for each of the sabbats, which means that this is our penultimate stop around the wheel of the year! 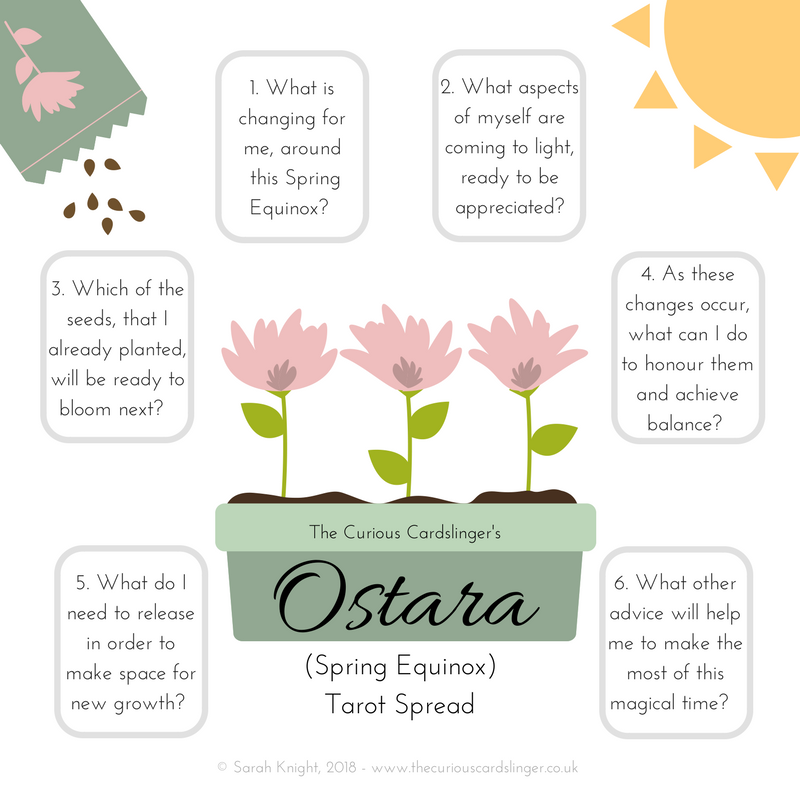 This new Ostara spread focuses on the seasonal changes within you - focusing on growth, balance, and enjoying the magic that is represented by this season of birth and growth. Click on the image below to see the image more clearly. As always, this spread can be used with any Tarot or Oracle deck of your choosing, and it's intended as a starting point only, so follow your intuition about whether to select one or more cards for any of the positions. Feel free to share your insights on social media, including the hashtag #tccostaraspread - you can tag me on Instagram and Facebook as @thecuriouscardslinger. I know that not everyone reading this post is an experienced 'cardslinger' - in fact, I love that so many readers have reached out about getting your first deck to participate. If you're new to reading cards, I've included a few tips for you which I hope will help. TIP 1: Take time to centre yourself and clear any mental clutter before you start your reading. If it's not a good time now, come back to it later. Being calm and focussed will give you a clearer and more helpful reading. You may like to take a few deep breaths (or to do a meditation) before you start. TIP 2: Shuffle and select your cards any way you like. There is no 'right' or 'wrong' way to do it. TIP 3: If you're relying on the 'book meaning' of your cards, you may feel a bit confused on how to interpret them in a spread like this - eg if you get a card with a challenging reputation. Before you look up someone else's interpretation, take time to study the imagery and make a note of anything that comes to mind while looking at the card. This is YOUR spread and YOUR interpretation - if a card means something to you then it doesn't matter what the traditional meaning of that card might be. After you've looked at the card, think about anything you already know about this card/suit/number and see if that makes it any clearer to you. Make a note of any ideas that pop up - no matter how bizarre - that's your intuition speaking to you, even if you don't understand what it's saying. TIP 4: When you've finished interpreting the spread as best you can, it still may not make complete sense right now. Don't worry. I always recommend journalling spreads (see this post). Take a photo of which cards come up in which position (and save a link to the spread to you can see the positions) and go back to look at them over the coming days and weeks. Often, things will become crystal clear as a little more time passes.